If there’s one thing St. Simons Island is known for, the amazing array golf courses would be it. From secluded courses that run alongside the gorgeous marshes to courses with sweeping views of 18th century plantation homes, you’re sure to find yourself enjoying a good game in the perfect setting. 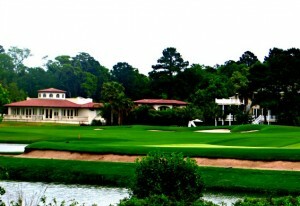 The King and Prince Beach & Golf Resort is the most well-known golf course in all of St. Simons Island. Originally, the land was where the Hampton Plantation sat, producing copious amounts of cotton, indigo, and rice. The award winning course was designed by architect Joe Lee and opened in 1989. The course is both challenging and breathtakingly beautiful, 18 holes of south Georgia beauty. Remodeled in 2009, the course twists and turns around ancient oaks, inspiring marshland, and by lakes and lagoons. The King and Prince signature section, however, displays its true craftsmanship. There are four holes on the back nine that are carved from marsh islands, requiring golfers to travel along 800 feet of bridges to reach them. The King and Prince Golf Course is one of those courses you can’t miss, so make time to play while visiting St. Simons Island. One of the newer St. Simons golf courses is the Frederica Golf Club. Established in the past decade, Frederica is well on its way to becoming one of the premier golf clubs in the state. Designed by architect Tom Fazio, the 400-acre course contains seven million cubic yards of sand and soil as well as 1100 giant oak trees. A true retreat, a trip to St. Simons Island isn’t complete without a round of golf at the Frederica Golf Club. If you find yourself on St. Simons Island at the Sea Palms Resort & Conference Center, their renowned golf course is not something you should miss. It is the only resort on the island that offers 27 holes of golf on site, and has been a favorite past-time of golfers since it opened in 1967. Designed by architects George Cobb and Tom Jackson, Sea Palms prides itself on a course that is challenging yet rewarding, despite ones level of skill. The course was recently renovated to much acclaim, professional landscaping and an extensive sand replacement and reshaping has elevated the style and made golfing an even more pleasurable experience. Sea Palms also provides excellent amenities such as private lessons, practice green, short game practice, and driving range. With three championship courses available, Sea Island Golf Club is the true golfing destination. Voted #4 of the 75 Best Golf Resorts in the US, Sea Island Golf Club offers something for everyone. The Seaside Course is located at the southern tip of St. Simons Island and is the host of the PGA Tour’s McGladrey Classic. The course was designed in 1929 by architects Harry S. Colt and Charles Alison and updated again in 1999 by Tom Fazio. Notable features include creeks, dunes, marshes, and the St. Simons Sound. The Plantation Course was remodeled by famed Rees Jones and is surrounded by amazing ancient live oaks and cedars, a real Southern course. Sweeping views of the Atlantic complete the picturesque course. Finally, the Retreat Course is a challenging course, designed to test even the most advanced player’s skill level. Completely renovated in 2000, the course is a combination of slope, sand bunkers, and undulations, perfect for the most confident of golfer. If you want to golf on St. Simons Island, Sea Island Golf Course is the way to go. Though only four golf courses grace the shores of St. Simons Island, the quality outweighs the quantity. Whether you’re looking for a professional, challenging course to test your skill or a beautiful, relaxing way to spend an afternoon, you’re sure to find something that’s perfect for you.